Get ready to join everyone's favorite DJ, Johnny Moonbeam, for his big Christmas Eve broadcast. He's spinning some of the greatest Christmas classics from the '50s, '60s, '70s, '80s, and '90s! He's joined by Helicopter Helen, bringing the Christmas traffic report, and sports reporter Tim Bucktoo. Plus, he's got a special message for everyone about the true meaning of Christmas. 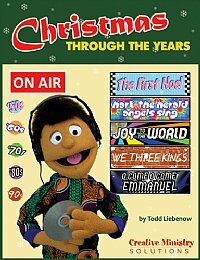 This trip through the decades features five classic Christmas carols, done in classic rock n' roll styles. In addition to the three main speaking parts, there are five minor characters who could be played onstage or by offscreen voices. The musical is 26-30 minutes long and includes CD, printed script, and production tips.